We met Capt. Heinz Krodel during the last IYCM in Genoa on board the beautiful motor yacht "Zoom Zoom Zoom" comfortably seated in the marvellous main saloon where we chatted. Where were you born Captain, which part of the world are you from? I was born in Germany, later emigrated to Canada and I now live in Italy, a country that I much love even though my roots are in Canada where I own a house in Vancouver. When did you have your first contact with the sea? Did someone in your family work at sea? I have loved water since I was a child and I've always played with boats. Later on I began getting involved in "white water Kajaking" along the streams and to sail catamarans, before moving up to larger boats of course. No, nobody from my family has ever worked at sea. Where did you do your studies? How did you develop your professional qualifications? I studied Electronic Engineering in Germany and I later joined the Merchant Navy as an Officer Cadet. I soon discovered though, that electronic engineering was, from my way of seeing things, rather boring so I decided to continue my career as a naval officer. After this I became a professional pilot and I spent a considerable time as a "bush pilot" flying over the seas and mountains of British Columbia (Canada). Even during my time as a pilot, I made myself available as skipper whenever there was an opportunity. Which boats did you sail on before and after becoming a Captain? Before becoming a professional Captain, I owned a yawl of 14 metres which was built to regatta in 1945 in Gotland, Sweden. After that I had a 20 metre ketch with which I sailed extensively all over the world. Could you briefly tell us what "Zoom Zoom Zoom" is to you? What or where is the true "soul" of this yacht? "Zoom Zoom Zoom" is my "baby". In fact I have been on the yacht since the hull was being built and watched it grow since. As a professional Captain, with many years experience on yachts and boats of all kinds, you can immediately perceive if a boat has a 'soul' about her, from the moment you set foot on board. I can therefore confirm that "Zoom Zoom Zoom" is certainly a lovely boat with a great soul. As you may know, the yacht was hit by two hurricanes and all in all came out of it with little damage to the hull. You need a great soul to get through something like that! 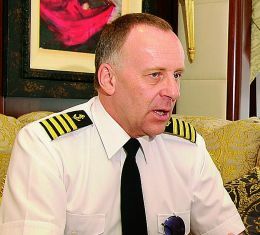 What can you tell us about being a professional Captain? What is the secret to face the difficulties of navigation and those of organising everything on board in such a perfect manner? The secret to best face the sea is the same as to how to face life in general: experience, experience, experience. The profession of skippering a super yacht certainly offers different opportunities to those offered as a captain in the merchant navy. Everything on board a luxury yacht, must always be at "five star" standard so to speak and I don't think one can learn everything about doing just that. Quite simply you either have the "feel" for such a thing or you don't. Naturally you must always add a lot of common sense and a good measure of psychology. I like being under way, it comes entirely natural. Is there something that, looking back, you would rather have done? I would have liked to study marine biology had I had time. Which has been your worst experience on board? I was sailing my yacht as one of the first to go through the Suez Canal just after the end of the war between Israel and Egypt. I didn't have a radar nor any other form of sophisticated navigational equipment on board, just a good old compass and sextant. We encountered a mine field not shown on the charts in the Gulf of Gubal,. Another time we had to face pirates in the Red Sea and the Indian Ocean during a six month charter for deep-sea snorkling well off the coast of Djibouti. To think of it now, it was a very stupid thing to do, more of a youth's prank really , we had a lot of guts and didn't think much about danger in those days. Another more recent challenge in my life was escaping the hurricanes "Katrina" in New Orleans and "Wilma" in Fort Lauderdale in 2005. I chose to evacuate the crew out of New Orleans a few hours before the hurricane hit the city, ( after securing the yacht in the best way possible). I can assure you it was no joke. A few months later we rode the eye of Hurricane Wilma. He who has ever had anything to do with a hurricane will know that it's not an experience you would wish on anybody. How would you briefly describe the life of a Superyacht Skipper? From both a professional and personal points of view? Is it difficult to keep family ties and friendships going in this job? A superyacht's Captain's life is easy to summarize: work, work, work and not much fun for several months of the year. It is a very stressful job on a boat that does a lot of charters like ours. My wife has been on board with me as resident chef and stewardess for some years now, but it is difficult to keep in touch with friends and the rest of the family. Considering, above all, that we are away all year round. When I met my wife Marinella. How is your relationship with the owner? Just a word will suffice: Excellent. THE CAPTAIN OF "ZOOM ZOOM ZOOM"
Previous work experience as Captain: "Relentless (44 m)", "Santa Cruz 3" (40 m), "Nova Spirit" (45 m) in Canada. General characteristics of the yacht (design, lay-out, structural and technological design, materials used): fitted with 2 engines of 3500 HP each (7000 HP in total), cruising speed 20 knots, maximum speed 26 knots, "integrated bridge system" (complete computerized system). Interior design (colours, materials, decor, lights): designer: Evan Marshall, style: classic colonial revisited. Favourite Marina: San Remo, Portosole, Italy.. Preferred Waters: Mediterranean , the Coast of British Columbia (10000 nautical miles of coast line between Canada and Alaska ). Which innovation pertinent to the yachting world has struck you most and why? AIS (automatic identification system). To avoid collisions, it transmits all the technical data ( route, speed, CPA, boat length, number of passengers etc.) to all vessels at visual distance.